Measuring ripeness and firmness of fresh apples. This processor did not have a way to objectively or quantitatively measure the texture of their products. Current methods for evaluating ripeness and firmness of apples were done through sensory panel testing and use of a penetrometer which both gave inconsistent and unreliable data. Testing was performed with a TMS-Pro Texture Analyzer, a 500N load cell and a 5mm diameter steel cylinder probe. 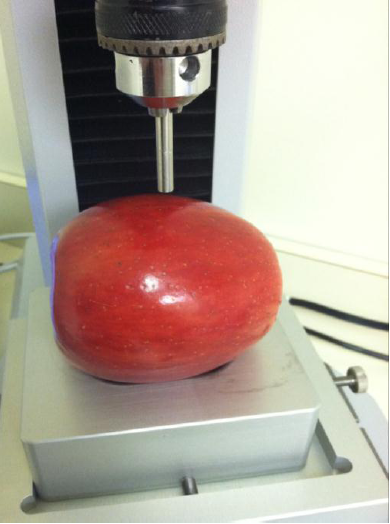 The apples were held in place with the TMS spherical sample holder. Taking into account that all apples are not identical in shape/size, the program was written to first start at zero then run down at 50mm/min until it sensed the top of the apple. Next, run into the apple 15mm at 250mm/min, then return to zero. The graph shows the curves from 3 types of apples in which 2 samples of each type were ran. The initial upward slope is the cylinder probe penetrating the apple. The peak represents when the outside skin is ruptured. The rest of the curve represents the probe penetrating through the flesh of the apple. 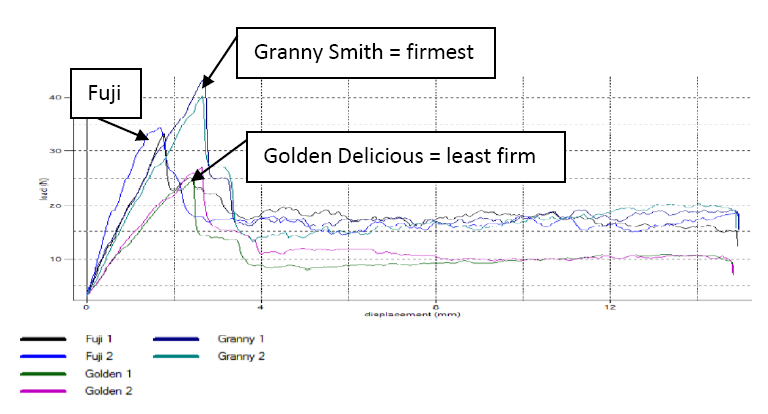 This graph shows the Fuji and Granny Smith apples were similar in firmness, with Granny Smith being slightly firmer and the Golden Delicious apples being the least firm.